Professional guidance, confidentiality, low prices, quality assurance and 24/7 customer support service availability. Standard features for any online essay writing service nowadays. Can austalianessay.com offer something special? Services provided by this writing company are numerous, and there are some special fields like: finance, statistic, psychology, management and nursing essay assistance. Additionally, the company can write assignments, term papers, dissertations, homework and business texts. Site content can’t be called the sales text, that’s mostly an overall description. Someone might consider this fact as a minus, and the others see a plus here, so that is the customer’s call. There are no unnecessary keywords everywhere as well, unlike some other typical websites. Still, in our opinion, the meaning of copywriting texts posted there can doubtfully be called as useful. So, the impression australianessay.com website made on us allows to think about the company as the professional organization with writers experienced in different specialized fields. This makes it look not perfect, but at least certainly better than the average writing assistance service. Prices page lets the potential client use the fast and understandable writing cost calculator. The key factors influencing the quote are: writing type, quantity of words per page (275 or 550), number of pages and the urgency of the text to be written. The earliest displayed time of the essay to be completed is 24 hours. If that is the fastest possible period, notice that there are services offering 6 times faster writing speed. Prices themselves can’t be called the lowest costs possible. Presented quotes are nearly common for the most part of typical services available on the market. This is neither good nor bad, just one more standard feature. Though, papers are told to be written from scratch with a 100% unique final content, unlimited revisions and plagiarism check. According to the info displayed on the FAQ page, there is a PayPal service included into supported payment methods. This seriously adds the reliability level to this website, but it would be better to mention about possible money transfer ways more detailly. There is a money back guarantee provided by the company. In case if the final grade of the writing doesn’t satisfy the customer, australianessay.com service says they’ll refund the text’s cost. Of course, the grade is to be solidly proven by the client. 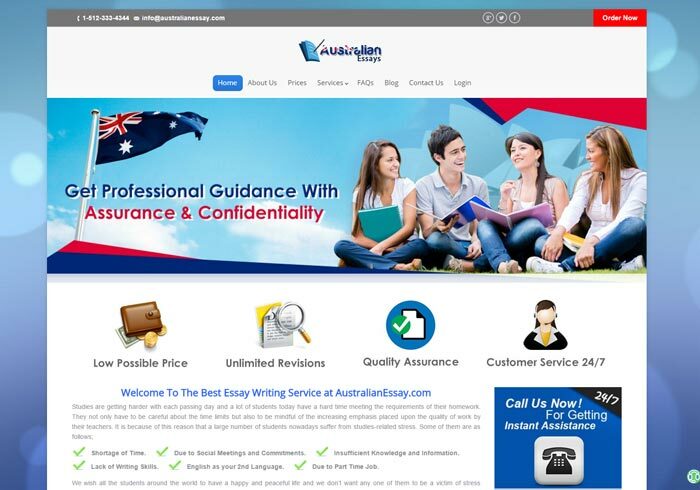 Australianessay.com is the standardly reliable writing service, offering a variety of texts including some very specialized topics. This is the reason why we can’t say it is an average company even if to take into account the doubtfully informative website content, and standard prices. Customer support service which is available 24/7 seems to be friendly and well-prepared. Managers provide qualified consultations on any question, and can even help the client to get the final text faster if needed. 15% discount on the first order is a pleasant bonus. By the way, we didn’t notice any aggressive pop-ups appearing on the website at all. Still, the ordered work (we’ve ordered an essay on a specific topic in psychology) was not as good as one could expect looking at the page and the prices offered. Keep that in mind when asking this company to write a text for you.